Be the first to share your favorite memory, photo or story of Helen. This memorial page is dedicated for family, friends and future generations to celebrate the life of their loved one. Age 85 of Owosso passed away Thursday, March 21, 2019 at Memorial Healthcare. A Mass of Christian Burial will be held 10am Monday March 25, 2019 at St. Paul Catholic Church with Father Dieudonne Ntakarutimana officiating. Burial will follow at St. Paul Cemetery. The family will receive friends at Nelson-House Funeral Home on Sunday March 24 from 4pm to 8pm. Helen was born September 27, 1933 in Melvindale, the daughter of Louis and Frances (Heinz) Brezina. She graduated from Owosso High School and then attended beauty school and was a member of St. Paul Catholic Church. Helen married Stanley Dedic on November 10, 1951 at St. Mary's Catholic Church in Swartz Creek; Stan predeceased her on March 1, 1998. Helen is survived by her children Jerry (Maryann) Dedic, Bonnie (Mike) Torok, Rosemary (Brent) Corbin and Bob (Jill) Dedic; grandchildren Elonka (Tim) Wright, Lindsay Dedic, Rachel (Ryan) Doyle, Alisha (Travis) Perdue, Nicholas Dedic, Mallory (Greg) Burroughs and Whitney (James) Story; seven great-grandchildren; sister Frances Ocedek; sister-in-law Beverly Brezina; several nieces and nephews and many other loving family and friends. She was predeceased by her husband Stan; her parents; sister Mildred Brezina; brother Jerry Brezina and brother-in-law Martin Ocedek. Memorial contributions are suggested to Shiawassee County Humane Society or the Shiawassee Conservation Club. 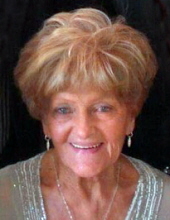 To send flowers or a remembrance gift to the family of Helen Elsie Dedic, please visit our Tribute Store. "Email Address" would like to share the life celebration of Helen Elsie Dedic. Click on the "link" to go to share a favorite memory or leave a condolence message for the family.